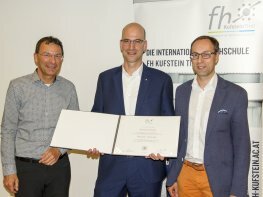 The FH Kufstein Tirol has so far created three Teaching and learning service centers that handle important cross-over functions within the teaching mission of this higher education institution. The Teaching and learning service centers bundle expertise with networking skills and organizational responsibility for areas required in all study programs. Coordination of teachers and courses in the field of languages, contact point for language placement tests and questions about language training, handling and organization of language certifications.